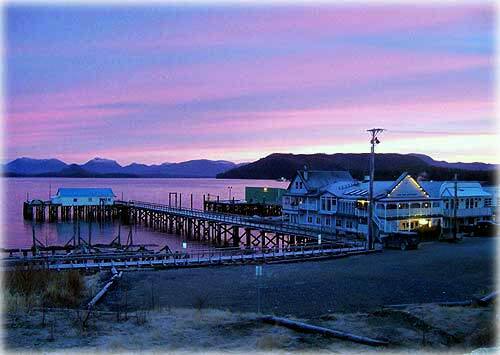 Ruth Ann's Restaurant and the former Petro fuel dock in Craig, Alaska. This photo was taken on Feb. 09, 2010. 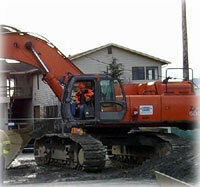 Ketchikan: Energized Power Line Down On Top of Excavator - Monday morning at 8:07 am, the Ketchikan Fire Department responded to a report of "a power line down on a construction site" in the vicinity of the Harbor Master offices in the 2900 block of Tongass Avenue. The power line appeared to be energized and the equipment operator, an employee of S&S Construction, was advised by Ketchikan Fire Department personnel to remain inside the unit until Ketchikan Public Utilitiy Electric arrived. Sitka: Sitka Man Sentenced in Murders of Four Relatives - Jason Abbott recently was sentenced to 140 years in prison for the murders of his grandparents, an aunt and an uncle, and the attempted murder of another aunt, in March 2008. Prosecutors and Abbott reached a plea agreement in which he was found guilty but mentally ill in two consolidated counts of first-degree murder and one count of first-degree assault. Judge David George said the defendant's mental health history was taken into consideration in fashioning the sentence. Alaska: Matanuska Experiences Mechanical Difficulties, Engineers Working to Correct Problems - The 46-year-old Alaska Marine Highway System (AMHS) ferry Matanuska experienced mechanical difficulties and is pier side in Sitka while technicians try to resolve the problems and return the ship to service. Monday's scheduled sailings from Sitka to Prince Rupert, British Columbia with a return to Sitka were cancelled by AMHS officials, as control system problems occurred. Fish Factor: Icing on fish pays off By LAINE WELCH - Salmon fishermen at Bristol Bay are putting the icing on their fish and it is starting to pay off. Deliveries of chilled salmon to processors by the drift fleet jumped to 60 million pounds last summer, nearly double from 2008. The result of the quality boost means more of the salmon is making the grade for pricier fillets and fresh/frozen products, instead of the lower value canning lines. And that means better paychecks for more than 1,300 Bay fishermen. Those are some of the results in the 2009 Bristol Bay Processors Survey by Northern Economics, compiles responses from eleven major processors about their chilled fish purchases, and their perceptions of how the Bristol Bay fishery is changing. The report is paid for by the fishermen-funded Regional Seafood Development Association, whose #1 goal is to improve fish quality in the Bay. "An ice bonus of 10 cents per pound is the rule of thumb, so that increased chilling conservatively resulted in an additional $2.7 million to $3 million in permit holders' pockets this year," said economist Jonathan King, lead author of the report. The salmon are kept cold with slush ice or refrigerated sea water (RSW) systems onboard the fishing boats until they are delivered to a dedicated tender or shoreside processing plant. For the past two years the RSDA has partnered and shared costs with the fish processors to deploy ice making platforms to fishermen throughout the Bay. The amount of ice available last year increased from 74 tons per day to 89 tons - an increase of 28,000 pounds per day. "Ocean Beauty feels strongly that increasing the amount of ice available on the grounds, and encouraging more fishermen to ice their fish should be the #1 priority in Bristol Bay. Icing on the grounds has a bigger impact on product quality than any other action we can take in Bristol Bay," said Tom Sunderland, director of marketing for Ocean Beauty Seafoods. "We have been willing to pay more for iced fish, and we will continue to do so. So far the market has rewarded us with higher prices for higher quality fish, and there is every reason to believe that will continue." The report shows that fresh/frozen fish production increased to more than 50% of all product harvested, an increase from 46.4% in 2008. Filleted product increased from 8.2% to 9.6%; meanwhile, canned salmon production dropped four percent. Alaska: Plan to Open Medicare Treatment Facility Announced; Public and Private Partnership Comes Together on Innovative Plan to Open Needed Clinic - Senator Kevin Meyer, R-Anchorage, announced Friday that he and other Alaska legislators will put money in this year's budget to help a coalition of medical professionals and non-profit corporations create an innovative clinic in Anchorage to serve Medicare recipients. "There are more than 26,000 Medicare recipients in the greater Anchorage area, and, because of a lack of certain kinds of doctors, as well as low Medicare reimbursement rates, a significant number of them have a difficult time finding a primary care physician," said Senator Meyer. "I have been working for several years now to bring together a broad coalition of public and private entities to create a new clinic to address this problem." Senator Meyer explained that a lack of internists, family practice doctors, combined with low reimbursement rates paid by Medicare, have left a lot of Alaskans without the primary care they need. By 2014, the number of Medicare recipients is expected to increase 40% to over 36,000. Dr. George Rhyneer, an Anchorage cardiologist, has been spearheading an effort to open a clinic for years. "This concept came to some other physicians and me a few years ago as a possible solution to the Medicare access problem, which didn't seem to be amenable to federal repair," said Dr. Rhyneer. "We hired a company to put together a business plan to see if it would pencil out financially. We now have a business plan in hand that shows that, if we operate efficiently and provide high quality care, we can begin to be self-supporting by the third year of operation. We just need financing to get it started." The feasibility study concluded the clinic was financially viable as a non-profit company. However, said Dr. Rhyneer, it will need start-up capital in the amount of $1.7 million. This will be enough to rent space in Anchorage, set up and staff the clinic, and operate it for the first two years. From the start, said Senator Meyer, it was clear that both public and private sector participation would be required for success. "I appreciate the bottom line business approach, with private sector buy-in, of Dr. Rhyneer and the others who have put this project together to solve a serious problem for our seniors," said Representative Bill Stoltze, co-chairman of the House Finance Committee. "Representative Stoltze and I will be championing this issue to make certain the needed funds are included in this year's capital budget," said Representative Mike Hawker, the other co-chair of the House Finance Committee. "I think this is a huge opportunity both to succeed, set ourselves as a national example and build a model that will be copied across the country in years to come." For the last two years, a group called ACCESS has been working with Senator Meyer on this endeavor. ACCESS is a non-profit corporation, comprised of the Alaska Physicians and Surgeons, the Alaska State Hospital and Nursing Home Association, Providence Health and Services Alaska, and the Alaska State Medical Association.